Now you can’t go to Berlin and not see the Berlin Wall. The wall was built in 1961, was about 45 kilometers long and divided West- and East Berlin till 1989. At this moment you can still see the wall at some points. The longest still remaining piece is the ‘East Side Gallery’ which is now decorated with artwork from more then 100 artists. Checkpoint Charlie is a former checkpoint between the Americans and the Russians at the border of East and West Berlin. When the Berlin Wall has fallen, Checkpoint Charlie was destroyed, but later they made a replica and placed it at the same spot. It is an extremely touristy place, but because of it historical value, it is worth a vist. This one is pretty impressive and has a silent, scary vibe. It was created as a memorial to the murdered jew of Europe. The site is huge and consits of 2711 blocks of concrete in different sizes. The idea behind is, was to let you experience what the jews must have been felt when they were in the concentration camps. The small alleys and the big blocks, make you feel disorientated, like there is no way out. Disturbing fact: The concrete is sprayed with a chemical layer so it would be protected against graffiti. The only thing is… the company that made the coating, was during the holocaust the co-owner of the company that produced the gas for the concentration camps. Do you feel the irony? This is an iconic landmark of Berlin and should be on the to do list of the city. Now it is the symbol of Berlin and it is the only historic city gate still standing. Taking a picture without tourist is nearly impossible here, so not picture perfect, but still impressive! The Reichstag is home to the parliament of Germany and has a lot of political value. Because of the architecture and the history it is one of Berlin’s top sites to visit. You can enter the reichstag and enjoy an amazing view of the city from the glass dome at the top. Make sure you book this ticket in advance (unless you want to wait in line for 2/3 hours to get a ticket). We were to late to book tickets online, so we didn’t go up. So we have a reason to come back on day! If you liketo see some street art, this is a good place to start. Different artists made beautful pieces of artwork here. In the center of Berlin, you can go to the big square called Alexanderplatz. It used to be the place where the market was held and is named after a Russian Tzar, Alexander I. Now it is a very vibrant place where there is always something to do. It is surrounded by shops, restaurants, cinemas and the famous Fernsehturm is based here. You can already see this landmark from far far away, the iconic Television Tower (365 meters), which is also the highest building of Berlin. If you are not afraid of heights, you can go up there for a 360° view over Berlin or even have lunch/dinner in the restaurant. Nice fact: When the sun shines on the tower, you can see a cross on the metal ball. During the cold war this was a little bit inconvenient, because of the atheistic DDR and they had the idea to break down the tower. Luckely the changed the story behind the cross and told themselves it was a plus sign for socialism. 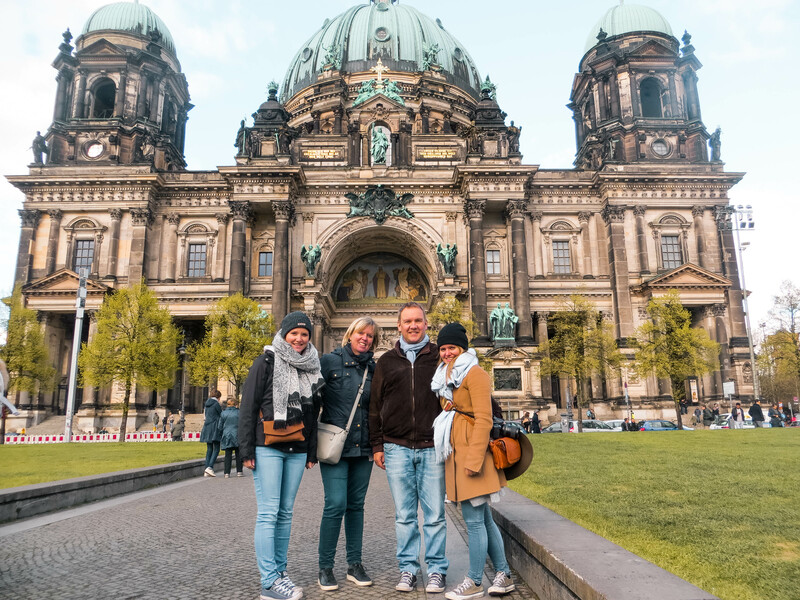 A fantastic piece of architectur and an impressive building… the Berliner Dom is not to miss. Altough we didn’t do that, there is the possibility to go up to the doms and have a view over Berlin. On a former industry terrain you will find beautiful street art, which is a real hotspot when visiting Berlin. This place can be used by artists to express themselves and they organise festivals and parties here. On sunday there is a flea market. A place that won’t bore you! We discovered this place by accident, but we really loved it. It was a quiet place to relax a bit and we had a beautiful view over the city. At the top of the parking garage of Neukölln Arkaden, there is a bar where you can enjoy a beer. There is also a small urban garden. So this was it… I’m so sad that Gilles has not experienced this trip with me. Now I’ve seen a glimpse of the beauty of Berlin, I definitely want to go back there in the future, because there is so much more to see. Hope you enjoyed reading about my fantastic trip in Berlin. If you have any questions, please let us know, maybe we can help you!